Italy is seen by many as the cultural center of Europe. To visit Italy is to explore its continent-spanning history, witness its jaw-dropping art and mingle with its litany of philosophers, artists, and poets. From its picturesque rural towns, complete with quaint churches, beautiful vistas, and vineyards to explore, to the sprawling, bustling cities with narrow, winding streets and ancient ruins to explore. Italy, in short, may be the perfect holiday destination. Beautiful people, beautiful food and beautiful scenery, and if you can shoot some Nazi’s in the testicles while you’re there, it’s just so much better. 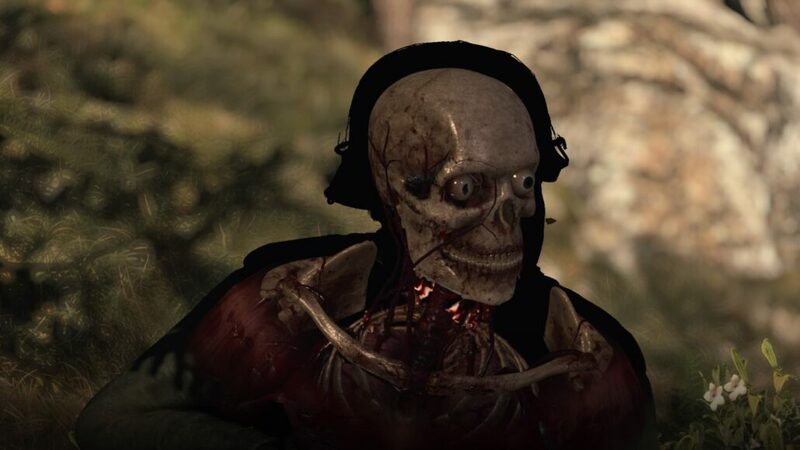 Sniper Elite 4, just released by Rebellion, is set in Italy if I hadn’t made that abundantly clear; somehow combining the indescribable beauty of Italy with the squirmish delight of watching a bullet travel through a man’s body in x-ray vision. The first two installments of the Sniper Elite series grayed out the world in the ruins of Berlin before the third escaped to the desert of some undiscovered color. 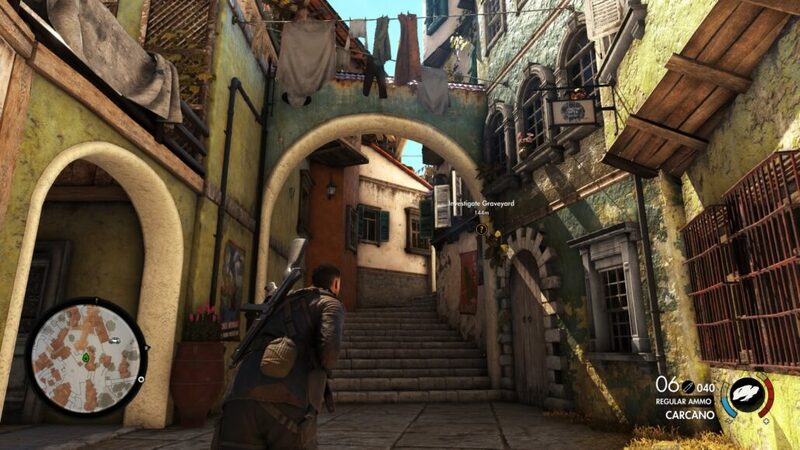 Following on chronologically from there, Sniper Elite 4 sends you off to Italy to soften the defenses before the invasion can begin. Although you make contact with the resistance, you’ll be out in the field on your own, being as quiet or loud as best suits you. The landscape captured in Sniper Elite 4 is both beautiful and deadly. You’ll find everything a good sniper needs: vantage points, hideaways, and empty expanses to take advantage of, all meticulously embellished spread across huge maps to explore. The map itself feels much bigger and less linear than its predecessors, with wide environments that allow for multiple opportunities for mischief. And mischief is the best way to describe this game. Despite its near realistic creation of bullet physics and human anatomy, this is not a serious game. When you see your first Nazi eye ball, or other spherical appendages, explode, you’ll want to do it again. Managing a trick shot that has a bullet collide off one skull only to penetrate another is as agreeable as it is macabre. This is a traditional power fantasy, and while you won’t be leaping into action, you will be more or less single-handedly dismantling one of the most infamous war machines in human history. In the first level alone I killed more dozens of enemies, more than you might expect as you line up each unpleasant death. That’s because Sniper Elite 4 does a surprisingly good job of breaking up the action, and letting the player choose the pace. A classic of the series is the empty lung that slows time and allows you to line up your perfect kill. This gives the player a chance to breathe, literally and digitally, and decide when and if to engage in most situations. 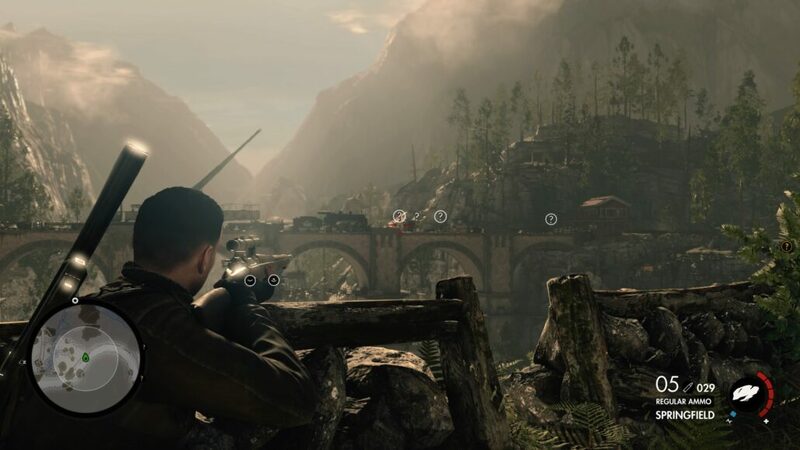 The stealth mechanics in Sniper Elite 4 add to the player agency. Every shot that rings out helps any surviving enemy narrow down your location. If you want to remain a ghost in the shadow of these rolling hills, you’ll have to constantly relocate. You’ll need to prioritize each kill and arrange each new location in advance, again deciding for yourself when and how to engage in combat. With enemies patrolling along roads and stationed at outposts, you are the active force in the game, choosing where to engage, when to engage, and for how long to engage. Players can, if they choose, decide to stand their ground in the face of exposure, and fight against a growing number of alarmed enemies. Although you can grab an automatic weapon and fight them at a much closer range, the cover system and combat feel flimsy and clumsy compared to the sniper rifle. Instead, you’ll probably find yourself holding the high ground and meticulously picking off soldiers brave or foolishly enough to make a break for you. These are exciting moments and you see the dozen enemies creeping ever closer, but the combat, at its peak, still feels remarkably paced, with each and every bullet counting. Unfortunately, the enemy AI does not feel any smarter than it has in any other game in the series. You can change the intelligence in the start menu, but generally, they will walk back and forth, search the immediate area around a dead body or loud noise, and run back and forth between cover when hiding from you. It can be pestering to see enemies not claim the advantage they had against you and instead move to a location with no cover or simply back the way they came. As the combat feels so intelligent as you adjust your aim for distance and wind, stupid enemies take away the thrill of a good move, like an enemy forfeiting before you can deliver the winning blow. 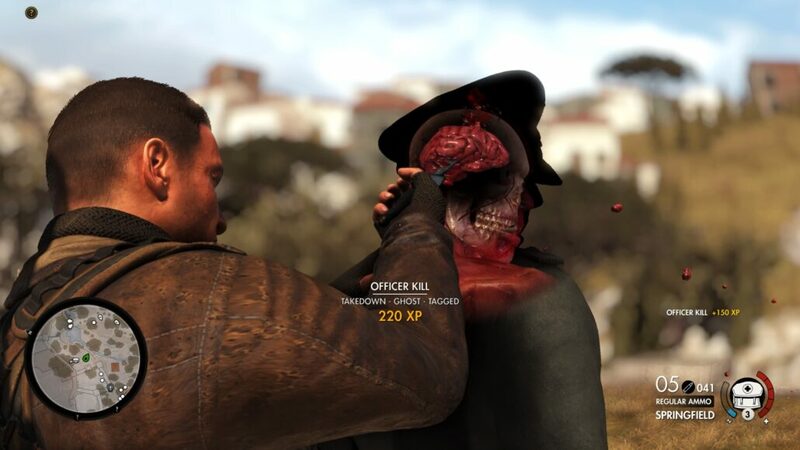 Where Sniper Elite 4 really takes a step forward in the series, more so than the environment, is multiplayer. You can now play the campaign in cooperative, compete against other snipers online and even fight shoulder to shoulder in horde mode. The uncontrollable nature of horde mode is by far the most amusing as you and your friends wreck havoc on wave after wave of enemies. Although in no way easy, the game is a constant bombardment of explosions, gunfire, and occasion gruesome death. Competitive play isn’t as exciting as it should be. Focused more heavily on close-quarters combat, the game modes suffer from floaty controls and sudden, confusing skirmishes in which victory is by chance more than by skill. Cooperative, though, is a strange beast. It takes the mischief away from the central game in an entirely unexpected way. I found myself over and over again taking the game much more seriously than on my own. We began coordinating headshots, making tactical use of explosives and providing cover for one another from complimentary lookouts. It was strange to find myself misbehaving more in single player, where normally players find themselves more stoic, but Sniper Elite 4 is full of these strange kinds of surprises. It isn’t a perfect game. The graphics sometimes fail to capture the beauty of the game, and the storyline and cut scenes are about as unflattering as they come. None of the characters have much to say other than to give each other directions and most of the game is spent to jumping from a seemingly random objective to the next. But with its player decided agency, amazing world to explore and roguish combat, Sniper Elite 4 is easily the best in the series. It can make you laugh and gasp in the same excruciating slow motion moment. It can make you quietly proud when you pull an amazing shot, and deeply satisfied when you can clear an entire town, bridge or armor vehicle of the Nazis. With gameplay that can shock, amuse and satisfy in the same slowed heartbeat, Sniper Elite 4 is the best game in the series. While it graphics, story and characters can feel a little flat, the gameplay has always been the focus, and is so perfectly tuned to make the rest seem inconsequential. The characters are so boring I've already forgotten their names.